Knowing how to master the 5-minute face can be a girl’s secret weapon. Even if you’re like me and love hair, beauty, and trying out different looks, there are some days you just can’t be bothered to apply a full face of makeup. Luckily, there is a way to achieve a natural, glowing look without having to follow a ton of different steps–it just takes the right products (and a little bit of practice!). Whether you’re headed to work, class, or simply going out to run a few errands, following these simple tips can help you to feel put together without sacrificing time. Let’s dive in! On busy mornings, the last thing you want to do is rush to apply foundation and concealer, only to find that it’s not properly blended. When looking to even out your skin tone, reach for a fool-proof foundation and concealer. Rather than using thick, heavy formulas, opt for something lightweight that will blend seamlessly into your skin. A foundation like Maybelline’s Fit Me Foundation Stick is a great option when you’re in a pinch for time. This product has a sheer, yet buildable coverage, and you can apply it on areas you feel you need the most coverage and blend out with your fingertips. It’s that simple! If you’re looking for a little more coverage after applying foundation, consider using a concealer like Glossier’s Stretch Concealer. Warm up the product with your fingertips and tap it under your eyes, around your nose, on blemishes, or wherever you need. The great thing about this product is that it has a very moisturizing formula, so it won’t look cakey or cling to dry patches. It also blends out best with your fingertips–so no need for brushes! 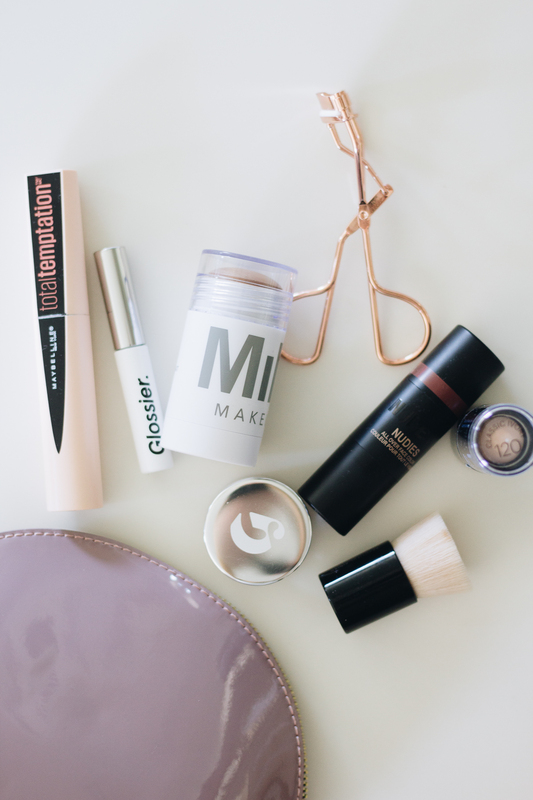 Using multi-purpose makeup products is the ultimate hack for the lazy girl. Adding blush and bronzer is one of the quickest, yet most effective ways to make you look more awake by adding a pop of color. Similar to foundation, cream or liquid formulas tend to be easier to blend. If you have time, you can apply both blush and bronzer, but if you’re in a rush, applying one or the other will do the trick. Milk Makeup’s Matte Bronzer is a cult favorite, and for a good reason! This product is very easy to apply and can give you a warm, sunkissed glow. Simply swipe it across your cheekbones, forehead, and jawline. You can even apply it to your eyelids to add a little bit of definition! What I love most about this product is that it isn’t sticky, so you don’t need to set it with a powder (one less step!). For blush, there are a ton of great options out there. 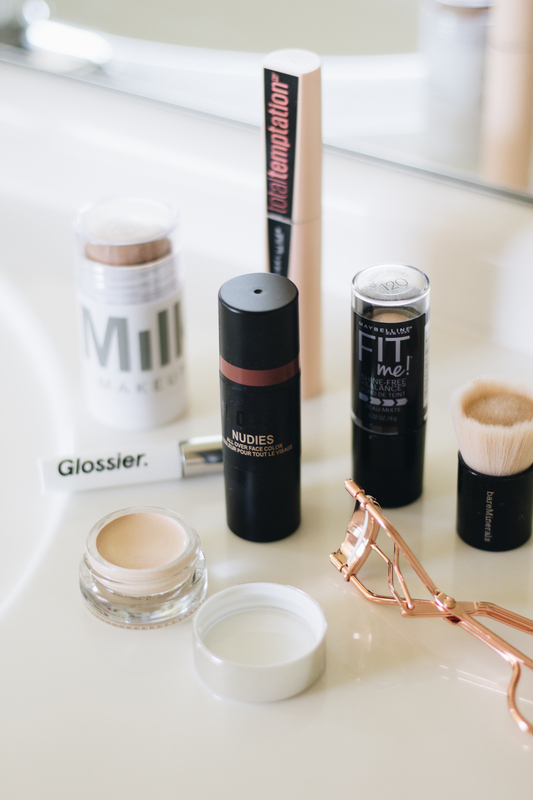 Nudestix and Glossier are both known for their cheek products, which can also be used on your eyes and lips. The shade Deep Maple from Nudestix is a great everyday color, and if you’re looking for a brighter shade, try Glossier’s Cloud Paint in the color Dawn. It’s commonly said that your eyebrows frame your face–but what if you don’t have time to shape them perfectly with a pencil? A tinted brow gel is a perfect solution. Glossier’s Boy Brow is a pomade with a creamy wax formula that thickens, fills in, and grooms brows into place. It comes in 4 different colors and is incredibly easy to apply. Simply swipe it through your brows and you’re done! The best part about this product is that it’s long-lasting–it will keep your brows in place all day long! A tiny dusting of highlighter can go a long way. Adding a little bit of glow can transform your skin and make it look like you tried a lot more than you actually did! There are a ton of different kinds of highlighters out there–all with different formulas and skin tones that they compliment. Once you find your favorite (Colourpop has a great range of colors), apply a little bit to the high points of your face, which includes your cheekbones, bridge of your nose, and cupid’s bow. If you want to add a little bit of extra shimmer, sweep it across your eyelids, too. Mascara is an essential step for many of us. 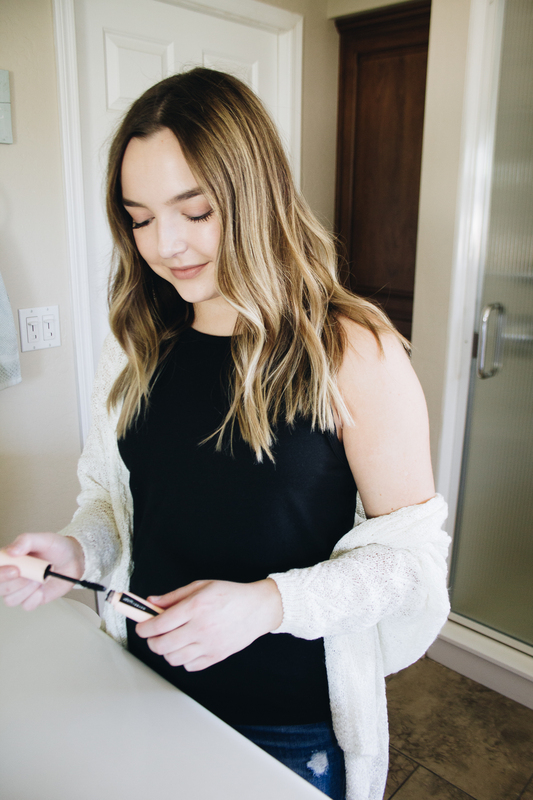 When you’re in a time crunch, you’ll want to reach for one that adds volume and length fast (meaning you won’t have to apply a ton of coats). Maybelline’s Total Temptation Mascara is a great option from the drugstore. This product adds volume and length without being clumpy and can be layered for a more dramatic effect. Plus, it lasts all day without smudging (hallelujah!). Last but certainly not least, a great way to pull together any makeup look is with a lip color. As mentioned previously, you can always use your cheek color on your lips for an easy wash of color. However, my go-to on busy days is a tinted lip balm like Glossier’s Balm Dotcom. This product has a pretty cherry tint that adds just the right amount of color. Since it has a balm consistency, you don’t have to worry about it smudging or coming off. Plus, you can apply it without a mirror! Simply put it on in the morning, throw it in your purse, and go about your day. What products are included in your 5-minute makeup routine? We would love to know in the comments below!